Congenital heart diseases (CHDs) are recognized as the most common type of birth malformations. Although recent advances in pre- and neonatal diagnosis as well as in surgical procedures have reduced the morbidity and mortality for many CHD, the etiology for CHD remains undefined. In non-syndromic and isolated (without a familial history or a Mendelian inheritance) forms of CHDs, a multifactorial pathogenesis with interplay between inherited and non-inherited causes is recognized. In this paper, we discuss the current knowledge of the potential molecular mechanisms, mediating abnormal cardiac development in non-syndromic and isolated CHD, including mutations in cardiac transcription factors, the role of somatic mutations and epigenetic alterations as well as the influence of gene-environment interactions. 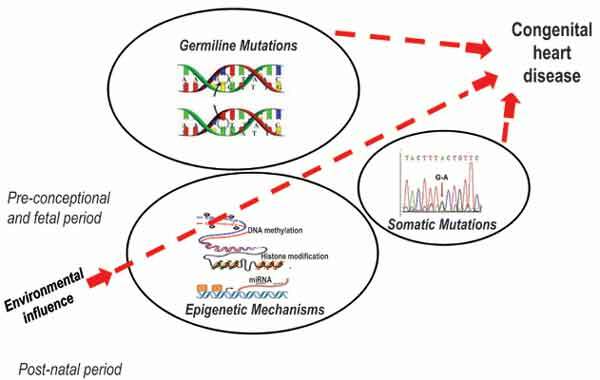 In the near future, the advent of high-throughput genomic technologies with the integration of system biology will expand our understanding of isolated, non-syndromic CHDs for their prevention, early diagnosis and therapy. Congenital heart disease, CHD, Genetics, Epigenetics, Environment, Point mutations, Methylation, microRNA. CNR-Institute of Clinical Physiology, Via Moruzzi 1, 56124 Pisa, Italy.